Since di Nigeria military don talk say dem dey monitor wetin people dey talk for social media and on top online, Nigerians don dey react. People wey BBC News Pidgin talk to say dem dey fear say e be like di government wan kill freedom of expression for Nigeria. People begin talk after di Director of Defence Information, Major general John Enenche, talk say di military don begin dey monitor social media for comments wey fit be "anti-government, anti-military or anti-security." 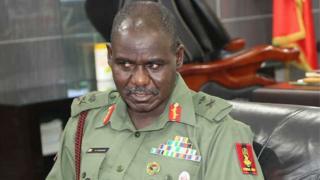 As Nigerians begin talk, Major general Enenche don tell BBC say dat no be wetin im really mean. Him say though dem dey monitor wetin people dey talk, dem no fit arrest anybodi. But dat one still no stop Nigerians from talking how dem feel about dis matter. Seun Oloketuyi- CEO of the Best of Nollywood Award. "We don already get one strong law wey bi cybercrime law, so I dey wonder wetin come make dem dey check our social media. I hope say dem no dey try to cage di opposition as dem dey prepare for di next election because this go dey very dangerous for country like our own. "I think, instead of that make government find better way to make people dey responsible for social media and different ways dey to go about it." "My own be say, this na very dangerous thing, for every democracy people dey free and get right to talk. We no dey military era. Wetin military need to do dey very simple, na court dem suppose carry person wey talk wetin dey bad go and no be dem suppose monitor social media. Na court get power to look matter of wetin person talk wey fit cause katakata. This one fit affect tori people in future if dem no do anything about am now." "Di decision of di military no be new thing world-wide. Dem dey do this kain thing for China, North Korea, Russia and some other country but to announce am out na wetin dey new. Wetin this mean now for everybody, na for people to dey careful with wetin dem dey post online. Law dey di country already and for military to say dem wan begin monitor, na like added voice to di law."